While I typically don't have a lot of quilting UFOs (unfinished projects), I do have some that I've intended to make for several years. The project (fabric, pattern, kit, etc.) is frequently shuffled from one pile to another until it's buried under a stack of other intended projects. Marilyn and I made lists of UFOs and planned projects a couple of weeks ago. I came up with over 12 projects, and Marilyn made a list of 6 projects. I consolidated my list to 6 with two projects per number, so we would both have the same numbers on our lists. Marilyn rolled a die - January's project number is 2. 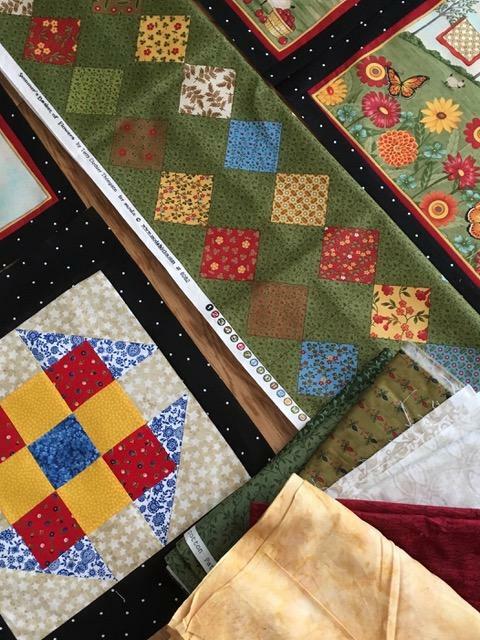 • six panel blocks (three houses and three barns) -- I love the colors and scenes in these blocks and even purchased some coordinating "cheater" fabric. Last week, I framed the panel blocks with a fun polka dot fabric and made three accompanying blocks and framed them, too. I pulled some fabric for borders, etc. I have no real plan for this quilt: it is evolving as I work. The quilt will be a summer throw for the sofa. • a row by row of a steam engine --- Inspired by Sara's (My Sewing Room) row by row project. You may remember that Marilyn, Harold, and I rode the narrow gauge train from Durango to Silverton, CO in October. Our trip was in the works when I saw Sara's row by row project, and I called the shop to order the kit. This project will be a perfect reminder of the fun time I had on the train. Progress is being made on at least one of these UFOs in January. Do you have a plan to complete some of your UFOs in 2018? Yes, I am working on UFO's and also making more. Hahaha! Your finish will be so pretty! Great way to organize and DO those unfinished and languishing projects! Sounds like a good way to get things done. I don't have any UFOs right now. I have my scrappy blanket and my Solar socks on the needles and both get some stitches done every day. Oh wait .........I have a little cross stitch ornament that is half done. Maybe I could call that my UFO and work on that too. I'm thrilled that you were able to get that row by mail from the shop in Iowa. It was a delightful shop with such nice people. Can't wait to see what you do with it. I've finished 2 small UFOs so far this month and am 1/4 of the way around binding a UFO quilt. I'm determined to either make something with what I have or give it away. As you know, I've got five quilts on the go. I try to do a little on at least one of them each day. I'm hoping to finish baby Aliza's quilt this weekend - or at least get it quilted and ready to bind. That's a great plan for finishing things up. I really only have two UFO's. A knitted log cabin blanket that I truly was not enjoying that's been shelved for over a year. It was to use up some scraps of yarn. I also have a shawl kit that I purchased from Knit Picks before the holidays. It's more of a summer shawl and I've had winter things to work on. I'm finishing a toddler blanket today at knit group this morning, (hopefully). I always have socks on the needles so I don't consider them UFO's. Wow a dozen quilts. One a month . That's amazing Nancy. I have the log cabin blanket that I sure hope to finish this year. Because it is fall colors, I bet I don't touch it much till Fall. Im weird that way! You are out of control. But I love it. Your fabric stashing and my sock knitting has inspired me. I decided the only quilt I want to try and make is a Christmas quilt so I have been doing preliminary window shopping of on sale Christmas remnants and cotton patterns like my Mom used to when I was a kid. I've also begun the slippery slope of googling How to Quilt Easy. LOL. You crafty people are going to get me in all kinds of trouble! I can't cut anything straight!! I can't sew?!? What am I thinking? Yep, I whittle away at UFOs but evidently I start a lot of projects that don't get finished through the year. I doubt if I'll be any better this year. But I can keep trying. Good luck with finishing a few UFO projects this year.